The Lowell, Massachusetts trio released their debut album, White Noise in November. The release, which spawned the singles St. Patrick and My House, scored rave reviews and planted them firmly in the 2015 Ones To Watch list. Here, vocalist Lyndsey Gunnulfsen talks about their time on Warped Tour and plans for the next 12 months. Hello Lyndsey, on a scale of 1-10, how was 2014 for you? Did you go into the year with any expectations? Pvris played Warped for the second time – what’s the secret to surviving that kind of tour? Which bands did you enjoy watching the most on that tour? What’s been Pvris’ highlight of the year? What’s been your favourite song of 2014? What five songs would you pick for a New Years Eve party playlist? 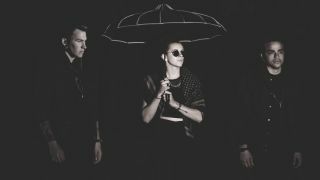 What are Pvris’ plans for next year?